Polish Fairy Tales is a collection of seven Polish fairy tales published in 1920. The collection by British translator Maude Ashurt Biggs was translated from the work by A.J. Glinski. In the fairy tale book’s foreword, Biggs explains that the tales are from a collection Glinski printed in 1862. Not much is known of who Glinski is, but Biggs says “these fairy tales come from a far past.” The tales Glinski shared and Biggs later translated came from the peasants of East Poland, and from the area known as White Russia. 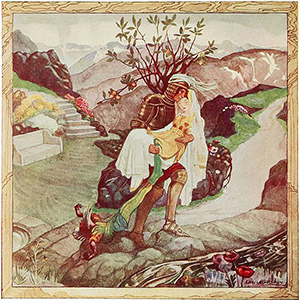 Illustration from Polish Fairy Tales. Illustrated by Cecile Walton, 1920. Biggs notes in her foreword too that she had to shorten them from the originals, because the Polish folk tales were fond of continuous repetition. She notes that readers will notice their similarity to German fairy tales, as well as Celtic ballads. Biggs lived in London and learned Polish from political immigrants who taught her the dialect. She published the first english translation of Pan Tadeusz, the national epic of Poland, in 1885.